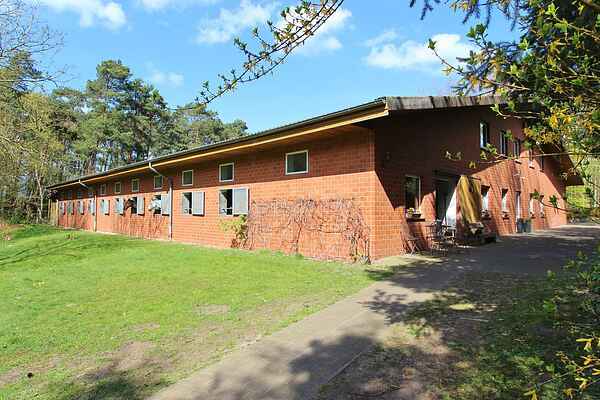 Welcome to the \"Kirchendorfer Heide\", the very popular and attractive region in the heart of Lower Saxony. The village Kirchdorf is situated approximately 50 km south of Bremen and 10 km south of Sulingen. Idyllic heathland, moor and forest landscapes dominate the image of the region, which is also well known for the asparagus cultivation. Here, on the edge of the forest, you'll spend your holiday amidst a charming landscape. The apartment is located on this idyllic horse ranch. You'll live in this beautiful and comfortably furnished apartment. The apartment is on the 1st level directly above a riding stable. The location is ideal for riding holidays or a holiday with your own horse. There are numerous riding possibilities across the heathland and the forests of the surroundings. Boxes for your own horses are available for a fee. Here, you'll also find extensive and varied possibilities to actively spend your leisure time. Miles and miles of cycling and hiking trails lead across the region. Popular destinations: Dümmer Lake, Steinhuder Meer, Animal Park Ströhnen, the Hanseatic City Bremen, natural open air swimming pool and much more.